Cinnamon, Buttons and Marbles are three gorgeous female guinea pigs. Cinnamon ginger and white, Buttons is black and white and Marbles is black, tan and white in colour! All three girls were a little nervous initially upon arrival, however they seemed to have settled well and are now showing their true personalities! They all have quite the voice on them, especially when it comes to veggie time!! Cinnamon would be the bravest of the trio, and doesn’t mind being handled and petted. Buttons and Marbles still need some socialization in that department. All girls like each others company, and because of this we would not like to split them up. They are currently housed in a spacious C+C cage setup, and are enjoying it very much. 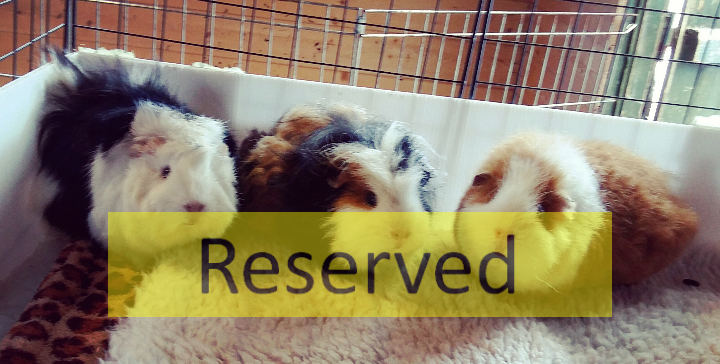 If you feel you have the home for this lovely trio of piggies, please call up to the sanctuary, speak to the staff and fill out an application form!